Join Kenyon College Head Volleyball coach Kendra Mosher for an incredible week of fun and learning. 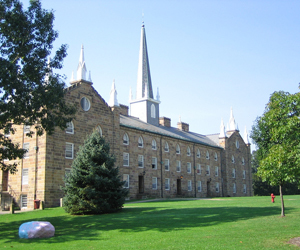 Hosted on the beautiful Kenyon College campus, the US Volleyball camp is for girls ages 8-18 of all skill levels. Featuring 5.5-6 hours of instruction, drills and games daily, each young player will receive personal attention from the coaching staff. Open to all levels of players, the camp will place an emphasis on individual skill development as well as team work and strategy. All aspects of the game are covered, allowing for solid building, all in a fun and competitive environment. Campers are placed into small instruction groups with players of similar age, ability and skill level. Each group will work on a comprehensive curriculum that is tailored towards the needs. Our volleyball camp is a 4 day / 3 night summer camp, one of the longest youth camps in Ohio. We feel it is important to have 4 days to ensure the proper amount of repetitions in our drills and strategy sessions. Each day will feature 5.5 – 6 hours on the field. Safety is our top priority both on and off the courts. The campers are monitored around the clock by the camp staff, the college security staff, and our camp directors. Activities are always performed in a group setting to ensure camper safety. Check in for all campers is on Sunday between 12:00-1:00pm at the camp dorm. Check in for commuters Monday – Wednesday will be on the field at 8:45am. Commuters will depart each evening at 8:15 pm if they do not wish to participate in evening social activities or 10:15pm if they would like to participate in the social activities. Airport transportation is available upon request for those flying into camp. The closest airport(s) are the Port Columbus Airport (50 miles from campus) and the Akron Canton (CAK) Airport (87 miles from campus). To arrange for a pickup, please email the office prior to making flight arrangements. The best times for arrival are Sundays before noon and departures Thursday after 6:00 pm. 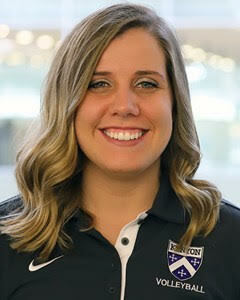 Kendra Mosher, was named the Head Volleyball Coach at Kenyon College in May 2018. In 2017, Mosher served as the Ladies assistant coach and helped guide the team to a 15-11 record as well as a fifth-place finish in the North Coast Athletic Conference. Mosher came to Gambier with previous Head Coaching experience at Cardington-Lincoln High School for three seasons. During the 2015 campaign, the Pirates were 7-16, but turned things around in 2016 by posting a 12-11 record, marking the program’s first winning season since 2011. In that same three-year span, Mosher coached six players who earned All-Central District honors and/or All-Mid Ohio Athletic Conference honors. During her playing days at nearby Mt. Vernon Nazarene, Mosher was a four-year starter as an outside hitter as well as a former National Christian College Athletic Association (NCCAA) All-America selection. She piled up 1,527 career kills, a total that still ranks 10th-best in Cougar history. She was tabbed an all-conference player in three of her four seasons and was named an All-America pick in the 2013 season after racking up 350 kills, 102 digs and 54 blocks in 29 matches played.